A new study finds that coral bleaching on the Great Barrier Reef is nothing new. Large-scale coral bleaching has raised concern about the future of the ecosystems and the impact their loss could have on biodiversity. The teams found the frequency of bleaching has increased since the 1800s and, despite corals’ ability to recover, there are fears they could now be approaching a “critical threshold”. Dr Nick Kamenos from Glasgow’s School of Geographical and Earth Sciences said: “It’s clear in the core data we examined that bleaching has been occurring on the Great Barrier Reef for at least 400 years, but the frequency of bleaching events has increased markedly since the early 1800s and those events have affected 10% more corals since the late 1700s. “We can see that corals have been able to acclimate and recover from past bleaching events. Bleaching occurs when water temperatures rise too high and disrupt the relationship between the coral and the tiny algae living inside it. When the algae are expelled, it leaves the coral a stark white. They can be reabsorbed when the water temperature drops again, but corals die if this separation is too long. Dr Sebastian Hennige from Edinburgh’s School of Geosciences said: “For this study we used the most conservative methods we could in some of the toughest corals out there today. The paper, titled Reconstructing four centuries of temperature-induced coral bleaching on the Great Barrier Reef, is published in the journal Frontiers. The study was supported by funding from the Natural Environment Research Council, the Royal Society of Edinburgh and the Scottish Government. The relevant chart is “B”, which shows the number of years in each decade when at least 20% of corals were affected. As you can see, although there has been a rise since 1800, there is little difference between recent decades and the 18thC. 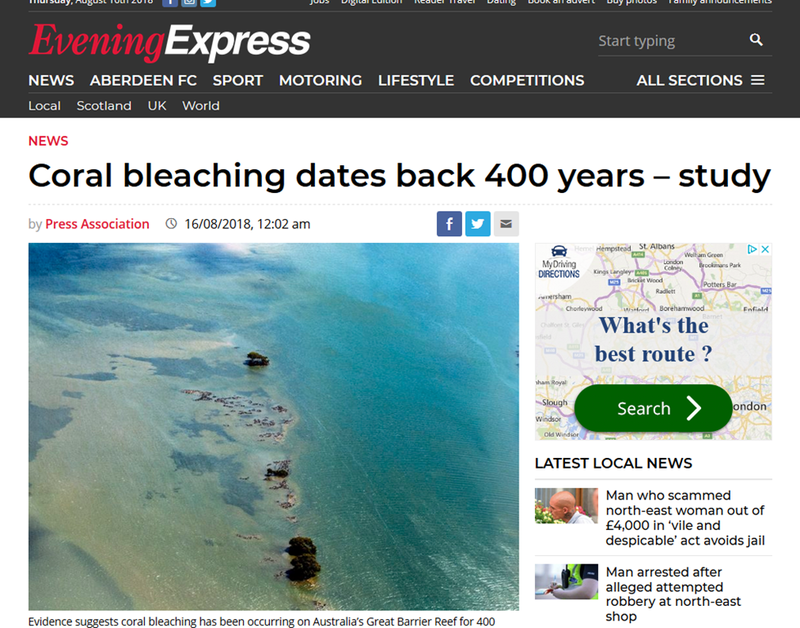 Indeed bleaching was far worse in the 1890s and 1750s. Worse still for the alarmists, chart “C” shows little change in the percentage of corals bleached per decade. There is the usual nonsense about how things will get much worse. But the actual facts show a completely different picture. It’s as if their research didn’t show what they expected. So they decided to lie, knowing full well 97% would never read the actual paper. Not to mention the fact that it is the sun that warms the oceans, not an increase in that old greenhouse gas, CO2. 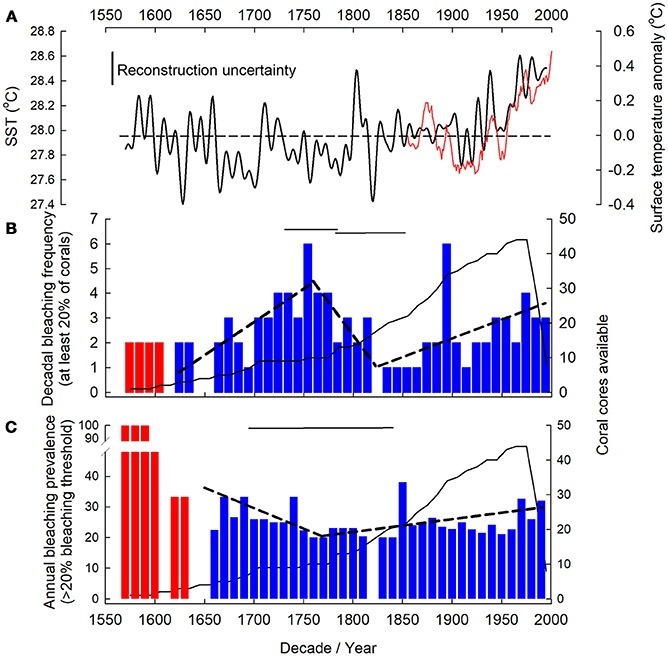 What Graph B does show is the effect of lower sea level during the Maunder minimum, followed by the increase in temperatures until (roughly) the cold winter of 1740, followed by colder climate through the Dalton Minimum. Then in turn the warming since 1850 with possible adverse effects in the colder 1890s and 1960’s. Doesn’t say anything about CO2. Absolutely agreed Graeme. I would however add ENSOs into the mix. If anyone wonders why the GBR bleaching is so often referred to in AGW-sponsoring papers, it is because the particular geographic location of the GBR makes it, especially parts of it, especially exposed to the sea level fluctuations that occur as a result of ENSO cycles. The lowered sea level phases can create faster and more powerful bleaching processes than that applicable to global sea surface temperature variations that many scientists believe corals can cope with anyway. Other reefs in the world are less affected during ENSO cycles but, naturally, aren’t as much fun to comment on if you wish to promote AGW. We have been over all this nonsense before. The sea water temperatures on the Great Barrier Reef have not been unusual. Ah! But the air temperatures have been raised by lots of hot air from grant seeking ‘scientists’. The millions they are wasting on “saving” the barrier reef is an absolute joke. Why is the university of Glasgow obsessed by events which may or may not be happening on the other side of the world in the backyard of another country, many times the size of Scotland, which has it’s own plethora of Universities studying the same non event? Salmon and sea trout in rivers and lochs on the west coast of Scotland have been in serious decline for decades to the extent that rod and line fishing and netting in the sea have been either banned or curtailed to such an extent that few now come to fish here. These draconian measures do not affect the east coast rivers where catches have held up well. May I suggest a useful line of research might be the effect of the AMO and the NAO on Atlantic populations when compared to the North Sea and whether there might be a causal correlation with Pacific salmonid population fluctuations that have chimed for centuries with the PDO. Or could it just be that the sea lice burden generated by Norwegian owned salmon farms throughout the west coast is attaching to smolts on their migration to feeding grounds off Iceland and Greenland? Or it could just be that the Scottish council knows the answer and like all politicians would rather we did not. Don’t forget the nice tax-payer funded holidays scuba diving on the Great Barrier Reef. Very enjoyable, even when you pay everything out of your own pocket! For those seeking actual data on which to work, here is a URL that gets you into the data base of the Australian Institute of Marine Science. The example given here is for Heron Island, on the Tropic of Capricorn, the southernmost long term station on the Barrier Reef. The parameters can be chosen interactively to access other sites and measurements. Many believe the forces of climate alarm got Professor Peter Ridd fired for saying what he thought about the recovery powers of the GBR. corals have been around for millions of years (billions?) and have weathered ice ages and interglacials and are still with us in abundance. Just another rent seeking broadside for the cheapseats. Here’s me thinking that when I write a paper (as I am right now), the conclusions must be supported by the results. But HEY! This is climate science. The rules must be different. Thank you. In Australia, the professor drummed out of his job for having an alternate view has been rewarded with a sizesble grant to continue his work. I’m sure you can find the details. I think the PM took the responsibility to rectify the error. Can someone please wake up this guy? What an amazing pile of human waste products? “The teams found the frequency of bleaching has increased since the 1800s and, despite corals’ ability to recover, there are fears they could now be approaching a “critical threshold”. So by looking as a very short time period in the reefs existence they “believe” “they could now be approaching a “critical threshold”. Not overly scientific a mere conjecture considering how long coral have survived in the seas and oceans. So I presume that during all that time it has suffered more stress and temperature variation then the pifflingly slight amount it currently has to endure. Who is to say that this bleaching is not a survival tactic by the coral polyps, whereby it sheds less efficient symbiotic organisms for better ones during this process? Also as just about all life in the seas and oceans are affected by the lunar cycles, could this process be linked to some unknown effects of the solar/lunar cycle, as well as temperature, ocean chemistry, and other biotic processes? With so little known about these creatures surely it is very premature to surmise that they are about to become very threatened by such small changes in the biosphere. These are very tough and resilient creatures as witnessed by the coral recovery in the H-Bomb area of Bikini Islands (https://www.livescience.com/2438-bikini-atoll-corals-recovering-atomic-blast.html ). Paul – sorry I didn’t see this sooner. Just looking thru the study. How in the world can they do this and not a single time draw attention to el Nino events? Notably the great 1877-78 el Nino? After all, it’s the more rapid changes in temperature that result in the most notable bleaching events.